Your cultural supervision is the best supervision I have every had and I've had clinical supervision for over ten years at my work. Wow! Sandra. Hastings. I just wanted to thank ... Charlotte as my cultural supervisor, I didnt realise how unwell I was once I started to open up and off load what I have been carrying. After having my second session with Charlotte ... I felt a huge weight come off me and the professional manner in which my session was with Charlotte was excellent. I felt my mana had been restored and I was able to hold my head high again regardless of my physical ailments as it corrected this area too, in many ways. C. C.
have to be the best I have ever come across." as you even in the whole of Europe." the one hour that you work with me." I first met Charlotte in 2004 when I was working at Awhina Whanau Services, a kaupapa Maori counselling service based in Hastings.She would travel weekly from Wairoa to attend our services where she provided mirimiri/romiromi and massage to staff and whaiora. This was something that the staff looked forward to as part of our self-care and healing. Having Charlotte available to provide healing for whaiora and staff was very valuable in assisting with taha wairua, taha tinana, taha hinengaro and taha whanau. I had regular weekly mirimiri and or romiromi for over a period of months where she assisted me with my own healing journey. Charlotte is very skilled, professional and has a great sense of humour with an in depth knowledge of traditional Maori healing. She has expertise which is rare in this day and age. I have been privileged to wananga with Charlotte who was and is very generous in sharing her knowledge. Barbara N. Psychotherapist. "The best that I have ever had." I have known Charlotte for about 12 years or so, primarily through her mahi / work in healing massage or mirimiri, but also as a friend. She deals with her mahi in a holistic manner, informing people as to the importance of breathing, natural nutrition, exercise, environment, stress management, etc., on the optimum well-being of all people by way of a newsletter, including those with whom she works. Charlotte's actual mirimiri mahi is surprisingly effective beyond the actual physical benefits and encompasses spiritual healing in a down-to-earth manner as well. Over the years, I have seen Charlotte do her mahi in a variety of places eg. in homes, on marae, at health hui, as part of health conferences including international indigenous health conferences, etc. I am pleased to write this letter of reference for Charlotte. Christine Te Ariki. Hastings. I am writing in support of Charlotte Mildon’s service with traditional Maori healing. WIT (Whatever It Takes) is the largest mental health service provider outside hospital services in Hawke’s Bay. Our service has more than 200 clients, 68 percent of whom are Maori. Over the years we have used innovative models to deliver services and in 2007 were awarded the Australasian Housing Institute’s annual award for innovation in support solutions. We used Charlotte Mildon’s services for a range of issues while Charlotte was practising in Hawke’s Bay. Our staff used Charlotte’s mirimiri for supervision and clients used her services for healing. We also referred people externally from our service. We still talk of some results from Charlotte’s work that were quite remarkable. In one instance, a client who had used intensive inpatient services for decades was able to resolve issues round sexual abuse. The client was using intensive resources with many organisations. After Charlotte’s treatments, the woman moved completely away from mental health services and has been stable since. Interestingly, she was not Maori, which gives evidence Charlotte’s treatments are cross-cultural. dealing with clients are exemplary in every way." equaled only by her extensive knowledge and skill in her field and training in healing." I found this course to be an absolutely magical experience. Pai rawa atu tenei wananga. Enjoyed it very much. A wonderful course of learning. Keep up the awesome mahi. Would love to do another course. Great. Learnt much. Felt really connected. A place to heal and be healed. Kia ora to the tutors and organisers. Kua nui te taonga I tuku iho ki ahau. Have had a wonderful enlightening 2 days. The rito of the harakeke, kei te pua wai. "In the latter part of last year, I was privileged to have been a participant on the Wananga presented by Ms Charlotte Mildon and her associates. I found the courses to be both beneficial and enlightening. 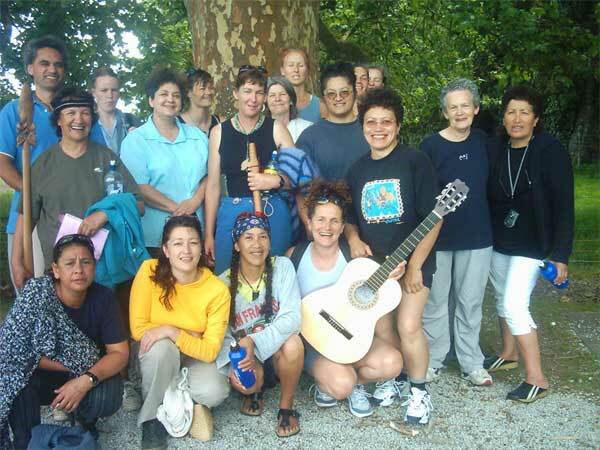 I developed a greater knowledge and understanding of the Maori culture in a communal living setting. I learned a range of strategies of dealing with physical, emotional and spiritual stressors. In particular, I have been able to experience in myself and to witness in others, the personal healing power of Pacifika Bodywork. By giving and receiving this massage, I was able to receive personal healing and to facilitate it in others. I would recommend this workshop to anyone who is interested in enhancing their personal well-being." "I fully endorse Wairuatanga workshops as being a magical spiritual healing experience. I have taken part in a number of healing workshops over some years and this series far surpasses anything I have ever done. I now have a much more in depth understanding of Maori protocol, healing and rituals. I have benefited greatly and so have my family and friends as I use techniques learnt in the workshops. Charlotte Mildon, the coordinator and the instructors were all very professional and approachable. There was a real feeling of connection and support between the participants. Thank you for the opportunity to be a part of a wonderful experience." This is a testimonial from Mihi Wilson who came to see us from Tauranga earlier this year 2007 because she had blocks in her creativity which was affecting her art work. Well done Mihi. No words can express the amazing change in my life. OK! at first I have to admit I was the big skeptic about the whole process as initially I walked into your home as the observer and active supporter for my man and his need to be healed. Man oh man was I in for a rude awakening when that healing extended over to me as well. Hehehe! So after the worst pain imaginable and at the same time the most amazing spiritual experience I've ever been involved with, in terms of another form of healing, and allowing myself to be free enough to experience it, skepticism no longer an option and put aside, I have to say thank you, thank you, thank you. I've asked myself over and over again, what the hell happened that day, my goodness I honestly thought i was going to die. The following days after that session have totally eliminated all previous skepticism and doubt from inside my over thinking analytical brain. I have a new lease of life. I have increased my water consumption, am eating healthier, am jogging (me the queen of sloths) and my relationships are healthier, I'm happier on a very spiritual level and I still have pains in my shoulders and back but am different in many, many ways. I have been playing my guitar, singing and have painted over 17 pieces of artworks over the past few days. I'm still smoking but will work on that one. My stress levels have decreased and i feel great. About the creative block...gone, gone, gone...so on that note thank you, thank you, thank you. To you and your family, may all things go accordingly and may you know that you have done so much good in my life. The following picture below was taken at the International Indigenous Womens Wellness Conference. From the back row - left to right are the practising 'Te Oomai Reia' Tohunga trained by Papa Hohepa Delamere - No Whitianga; Christine Melligan/Whakatane, Charlotte Mildon/Wairoa, Nella Bluett/No Whakatane and our trainee Moana Hutana from Heretaunga. Sponsored by the Harata Meretana Ma Trust, these women had the honour of doing healing work with women from all over the world. These are just a few of the comments we received while working at the 'Aotearoa Indigenous Women & Wellness' conference in Flaxmere, Hastings. November 2004. It certainly was an honour to be able to work with and access the wisdom of the indigenous medicine women who attended this conference. Our ancestors brought us together so that we could become one with the universe on many levels, to create the 1000 year vision for our children and grandchildren yet to come. This testimonial is from Cherie Kurarangi Kara - Community Events Co-ordinator, Public Dreams Trust, Box 1368, Hastings. Phone (06) 873 0041 Ext 820 Mobile 021 254 0434. Just wanted to once again thank you for your amazing work with my baby Pikikura, at the Indigenous Women's Wellness conference, November 2004. Pikikura was born 14 weeks premature at a birth weight of only 900grams her medical history included massive breathing difficulties or Respiratory Distress Syndrome (RDS) because of her immature lungs. She was unable to be sustained by herself and required CPAP, multiple apnoea and bradycardia, other serious diagnosis included cerebral palsy the seriousness of which was yet to be determined, and most babies born at her gestation 89% do have a mild case. Since your therapy with her she has astounded her neonatology team and pediatrician Russell Wills by making remarkable physical advancements in her abilities and learning. Her only current issue at present is plagiocephaly, a condition which can be caused by torticollis, which means the neck muscles are too tight, have inadequate tone, or are shorter on one side than the other, causing the head to tilt one way while the chin points in the opposite direction. As a mother who has been through extreme traumas with a child and who has been told by conventional medicine that "there is nothing more we can do" no words I could ever say would explain or give enough value to what it is you have done for her, she has exceeded the expectations of not just her medical professionals but myself as well even with all the hope and admiration I had previously held for her. I can only truly say that you have a gift and children with any ailments would be ever so lucky to be in your loving hands. Aotearoa Indigenous Women & Wellness Visitor from Phoenix, Arizona. Papa Hohepa Delamere, our teacher, has travelled extensively around the world teaching this work. This testimonial of 'Te Oomai Reia' is from Janice Vitavec in California. "I met the Māori healers for the first time in California about two years ago. My experience in meeting them was very intense and carried a wide range of feelings and impressions. Watching them do their work for the first time, I couldn't believe the energy in the room. It was bright and immense. I was instantly fascinated and afraid at the same time. It was so beyond what I had ever seen in healing work before that I was shocked and found myself on unfamiliar ground. The ancient Maori techniques utilize tools from nature such as stones and sticks. I observed them physically and psychically restructure peoples bodies. The level of their work spans the physical, mental, emotional and spiritual realms of existence as well the use of traditional aboriginal knowledge of astrology and acknowledgment of self in relationship to divine universal connection. They come to California, other parts of the USA, and abroad once or twice a year. There are four people in their group and they work as a team during the sessions. The leader of the team is "Papa Joe" a very large man in both size and heart, there is also his wife Joanna, Atarangi Muru and her husband Billy. My first time receiving their work, Papa Joe worked on me alone, as I was nervous he guided me toward emotional balance with deep focused breathing. I began to open myself to the energy of his work and from there smoothly dived in to the deep and subtle levels of myself until I came to a heightened consciousness in which each breath felt like pure bliss. This is the level of their work. I have been fortunate to study with them the last few times that they have come to the USA, their guidance and techniques come in to my work in amazing ways and I find that the level of my trust in my knowledge of what needs to be done is tenfold. I am so glad to be hosting them here at Spirit Winds School and to be of service to them in passing on their knowledge which is so needed in the world."